Désolé, nous avons pas encore traduit cette page en français. Nous y travaillons. A typical steering-box layout Top cover andbolts. Look forleaks aroundthe edges. Sector shaftoil seal. Check the gasket and seals for leaks, and the moving parts for wear. 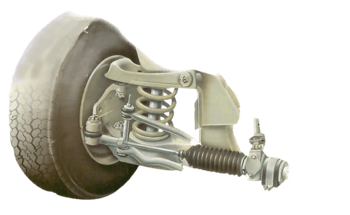 Get a garage to renew leaking seals or replace a worn or damaged steering box. 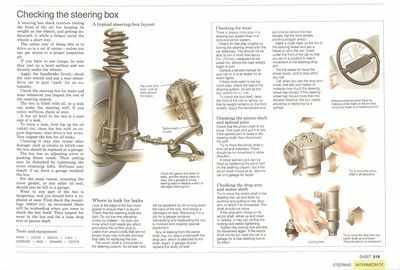 A steering box check involves raising the front of the car but keeping its weight on the wheels, and getting underneath it while a helper turns the wheels a short way. The safest way of doing this is to drive on to a set of ramps — unless you can get access to a proper inspection pit. If you have to use ramps, be sure they rest on a level surface and are directly under the wheels. This video course is the best way to learn everything about cars. Three hours of instruction available right now, and many more hours in production. Apply the handbrake firmly, chock the rear wheels and put a rear-wheel-drive car in gear (`park' for an automatic). 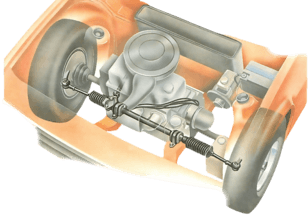 Check the steering box for leaks and wear whenever you inspect the rest of the steering system. The box is filled with oil, so a leak can make the steering stiff. If you notice stiffness, check at once. A low oil level in the box is a sure sign of a leak. To trace a leak, first top up the oil (See How to lubricate the steering system), clean the box with an engine degreaser, then drive a few miles. Now inspect the box for oil leaks. Cleaning it may also reveal other damage, such as cracks, in which case the box should be replaced at a garage. The box has an adjusting screw or packing shims inside. Their setting may be disturbed by tightening the cover retaining bolts. Stiffness may result; if so, have a garage readjust the box. For the same reason, renewing the cover gasket, or any other oil seal, should also be left to a garage. Wear in any part of the box is dangerous, and you should have it replaced at once. First check the mountings (See Checking steering-box mountings), as movement there will be misleading when you come to check the box itself. Then inspect for wear in the box and for a loose drop arm or pinion shaft. Look at the edge of the top cover gasket to ensure that it is sound. Check that the retaining bolts are tight. Do not turn the adjusting screw by mistake - be sure you know which bolt heads are which, and where the oil-filler plug is. Leaks from around bolts that are not simply loose may indicate damage that calls for replacing the box. 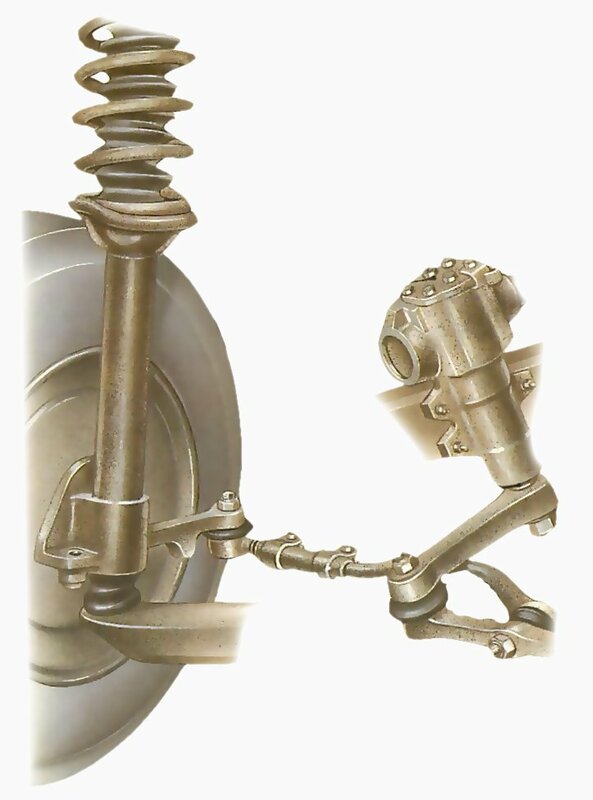 The pinion shaft is connected to the steering column. An oil leak here will be apparent by oil running down the back of the box, and shows a damaged oil seal. Replacing it is a job for a garage because dismantling and readjusting the box is involved and requires special equipment. Any oil leaking from the sector shaft may run down underneath the drop arm, which is attached to the shaft. Again, a garage should replace the faulty oil seal. Measure steering-wheel travel by making a chalk mark on the rim and using your finger as a reference point. There is always more play in a steering-box system than in a rack-and-pinion system. Check for free play roughly by turning the steering wheel with the car stationary. You should not be able to turn it more than about 75mm, measured at the wheel rim, before the road wheels begin to turn. Consult a service manual for your car or a local dealer for an exact figure. If there does seem to be too much play, check the rest of the steering system as well as the box. To check the box itself, raise the front of the car on ramps, so that its weight remains on the front wheels. Apply the handbrake and put chocks behind the rear wheels. Set the front wheels pointing straight ahead. Make a chalk mark on the rim of the steering wheel and ask a helper to sit in the car. Crawl under the front of the car so that you are in a position to watch movement of the steering drop arm. Tell the helper to move the wheel slowly, and to stop when you call. Call when you see the drop arm move, and ask your helper to measure how much the steering wheel has moved. If the steering wheel has moved more than the allowed distance, the box needs adjusting or replacing by a garage. Try to move the pinion shaft in all directions. Check that the pinion shaft is not loose. First push and pull it to see if the splined joint is loose in the steering shaft, then disconnect the joint. Try to move the pinion shaft in and out and sideways. There should be no movement in either direction. 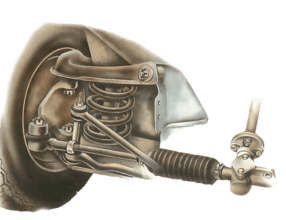 A loose splined joint can be fixed by tightening the pinch bolt on the steering column, but if the pinion shaft moves at all, take the car to a garage for repair. Try to move the drop arm and sector shaft up and down. There should be no movement. Try to move the sector shaft in the steering box up and down by pushing and pulling on the drop arm, to which it is connected. The shaft should not move. If the drop arm moves on its sector shaft, either up or down or radially, it may just be that the locking bolt needs tightening. Tighten the locking bolt and test for movement again. If the sector shaft moves too, take the car to a garage for a new steering box to be fitted. Pierre sait beaucoup sur les pneus. Il parle français et joue de la batterie. Il prend son café avec du lait. We take this car to pieces and then build it again, explaining how every single part works. By the time you finish watching this, you'll understand everything inside a car. Watch us take a Mazda MX5 Miata to pieces, and then build it back together again into a modern working car. 3+ hours of HD video available now. Production complete by June 2019. Every part explained in detail. Over 20 hours of footage — see the contents. Buy now and get our 150 page PDF for free. This is the most in-depth course on car mechanics ever produced. Buy now and save 75%. Avez-vous trouvez ce site utile ? Vous pouvez maintenant obtenir l’ensemble du contenu du site sous un seul PDF. Imprimer les pages pour les collés dans votre garage. Si vous estimez notre travail et souhaiter nous aider à rendre How A Car Works meilleur, c’est PDF sont au prix de $5. Le PDF pèse 80mb, il est donc en haute résolution! © 2019 Une Voiture International.